Initial planning code for Nico Minoru-themed layout, launched Sept 18, 2006. Today is the final day of AAPI Heritage Month for 2014, and after a great month of celebration and education, I thought I’d take a minute to reflect: as of this year, Reappropriate will have been online (in some form or fashion) for 12 years. It’s incredible to think about how long this site has been with me. For nearly one-third of my life, Reappropriate has been a part of it. This blog been a source of incredible inspiration, and also at times of profound frustration. 12 years after I launched Reappropriate, I have the opportunity today to stand back and wonder: was it worth it? 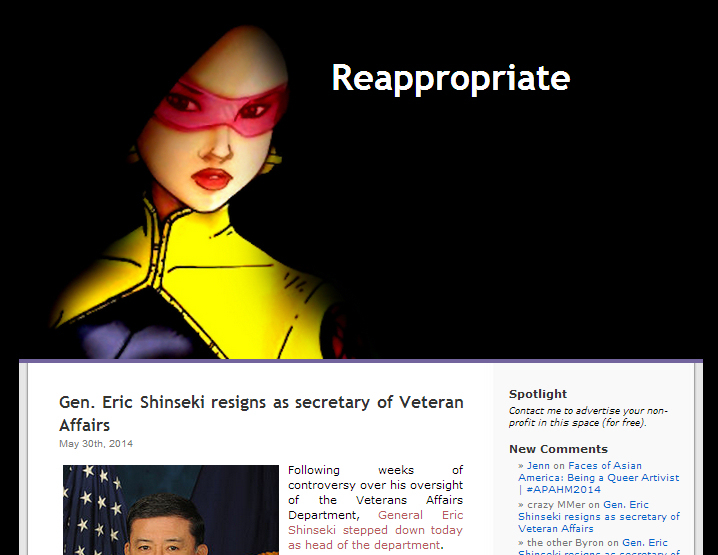 Initial planning code for Cassandra Cain-themed layout, December 2007 – 2010. The Reappropriate origin story is pretty cliched: in December of 2001, I was home on Christmas break and was looking for online resources to develop my consciousness as an Asian American woman. I had just joined my on-campus Asian American student group, and was just coming into my identity as a feminist. I had been spurred to become more aware of social justice causes by an on-campus racially-motivated sexual assault of an Asian American freshman, and from this incident felt it important to do my part to help elevate the voices of women in contemporary Asian American discourse. That day in December of 2001, I typed “Asian American blog” into Google and pulled up only a handful of hits, notably Angry Asian Man. AAM celebrated its 13 year Angryversary this year; that day, it was less than a year old, but already it was my go-to site for the development of Asian American consciousness. At a time when blogs were themselves still a new idea, Angry Asian Man was an example of what an Asian American identity blog might look like. 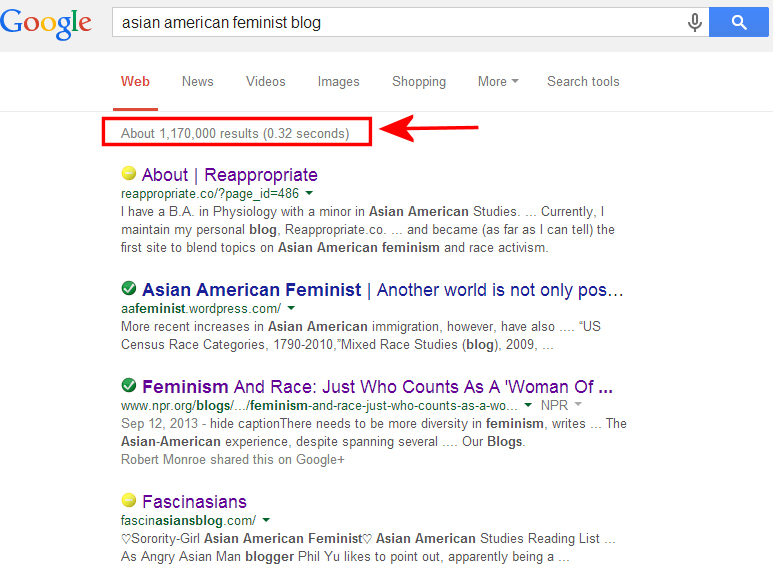 Then, I typed in “Asian American feminist blog” into Google, and hit submit. Nothing. I pulled up exactly 0 results. Not knowing what to call my new site (I toyed with “Angry Asian Woman”, but wisely decided that would be a touch derivative), I ultimately settled on “Reappropriate”, a word that I hoped would capture the purpose of this space: a spur to action in the reclamation of our stories, our histories, and our heritage. Through Reappropriate, along with my time at YellowWorld.org where I served as moderator, I was able to participate in several of the first campaigns wherein Asian Americans harnessed the power of the internet for social justice. In fact, one of the landmark moments in the history of digital activism involves Asian Americans: in 2002, one of the first internet-coordinated social justice actions involved Asian American college students across multiple campuses communicating through forum boards like YellowWorld, Rice Bowl Journals, Fighting 44’s, Model Minority, and Asian Avenue to simultaneously picket Abercrombie & Fitch stores across the nation, demanding that they pull racist anti-Asian t-shirts from their racks. Two years later, we again used the internet to coordinate a protest of Details Magazine for their “Gay or Asian?” feature. Inspired by these victories and several other smaller ones, I became convinced that blogging could be a powerful tool for social change: the role of blogs could be to educate readers about important political topics, to stimulate necessary conversation for the ongoing development of Asian American consciousness, to energize readers to get more politically involved, and to connect readers to projects that might harness that energy and direct it towards coordinated action. As the popularity of forum boards waned (today, most of the highly-trafficked AAPI forums of the mid-2000’s are offline), the influence of self-published identity politics blogging grew. By 2006-2007, several Asian American blogs — including (but not limited to) Angry Asian Man, Racialicious, Sepia Mutiny, Hyphen Magazine and, of course, Reappropriate — were thriving. Organically, we formed a sort of digital activism engine, one that was vigilant for incidents of anti-Asian racism that could rapidly organize letter-writing campaigns and other protest actions. In the months leading up to the presidential election of 2008, Asian American bloggers launched one of our most coordinated digital campaigns to-date: we established a collective of writers to publish nearly daily in support of Senator Barack Obama’s presidential campaign from an Asian American perspective — Asian Americans for Obama. Ultimately, our collective efforts helped lay the groundwork for this. One of the highlights of my career as a blogger was when Konrad Ng, President Obama’s brother-in-law, called me completely out-of-the-blue to thank me on behalf of the Obama campaign for my efforts. That being said, while blogging can be a high-reward activity, it can also be a high-cost investment. It’s a major time commitment, and can be exhausting to keep up with, as well as emotionally (and even financially) draining. I’m as capable of having my feelings hurt as anyone else. There were a few times when the strain of balancing this blog with my daily life was too much, and I went on extended hiatus from blogging. A dark theme that was used as a place-filler during one of my WordPress updates. Quickly replaced with something brighter. I started this blog when I was 19 years old as one of the new kids on the block; today, I am nearly 32 years old and considered one of the “old guard”. I’ve had the chance through this blog to meet several inspiring activists and to watch how their patient guidance and mentorship of me has helped my own perspectives mature (which is also even evident by how the appearance of my site has changed over time). 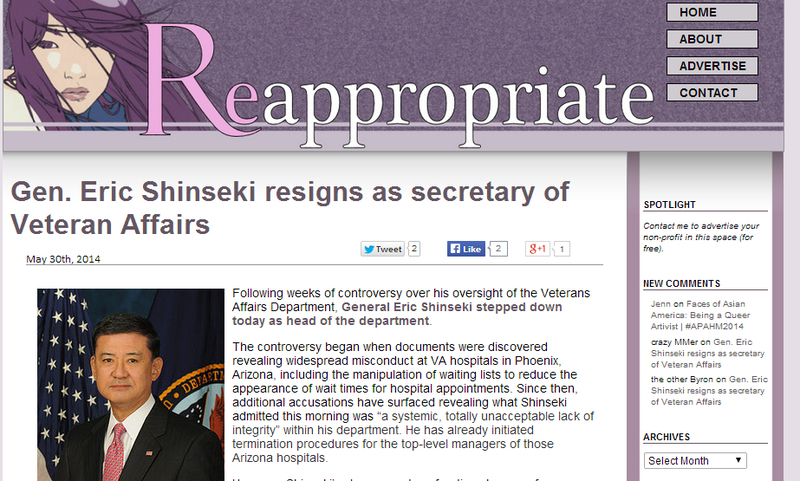 And, after over a decade, Reappropriate has become an Asian American activist and feminist space that (I realized through the writing of this post) is older than Facebook, Tumblr, and Twitter. Today, I look forward to supporting the next generation of Asian American youth take digital activism to the next level, in much the same way that “my generation” harnessed the power of the internet a decade ago for social change. If this blog — and particularly readers like you who have helped support Reappropriate over the last 12 years — had even a small part in making that number possible than yes. Absolutely. It has been totally worth it. So, thank you to all of my readers — old and new — for making the last 12 years an incredible ride. Here’s to the next 12 years, and hopefully more! Happy AAPI Heritage Month 2014! There’s still so much work to do. Let’s keep on keepin’ on!